"When I first discovered psychological type it provided me with so many answers: why two people would react so differently to the same situation; why they would approach the same task from completely different angles; why something would appeal to one and repulse the other; how they could completely misunderstand what each other was saying. . . . [Then] came the questions. Why are some people flexible and adaptable with their type, while others are trapped and restricted by their type?" 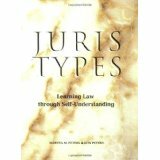 "Much as one might use a compass to determine where one is in the physical world, Jung's typology is a tool for psychological orientation, a guide to understanding both oneself and many of the difficulties that arise in relationships . . .
Jung's model [of psychological types] is concerned with the movement of psychic energy and the way in which one habitually, or by preference, orients oneself in the world. . . . . Jung differentiates eight typological groups: two personality attitudes--introversion and extraversion--and four functions (modes of orientation)--thinking, sensation, intuition and feeling--each of which may operate in an introverted or extraverted way. Introversion and extraversion are psychological modes of adaptation. In the former, the movement of energy is toward the inner world. In the latter, interest is directed toward the outer world. In one case the subject (one's own inner reality) and in the other the object (things and other people, outer reality) is of primary importance. The function of thinking refers to the process of cognitive thought; sensation is perception by means of the physical sense organs; feeling is the function of subjective judgment or valuation; and intuition refers to perception by way of the unconscious . . . .
[I]n practice the four functions are not equally at one's conscious disposal; that is, they are not uniformly developed or differentiated. Invariably one or the other is more developed, called the primary or superior function, while the rest remain inferior, relatively undifferentiated." "For the truth is, full human consciousness has still to be won. It is waiting to be born from a marriage that has not yet taken place, that only can take place at the deepest level of the psyche--the marriage between thinking and feeling. In everyday life these two functions tend to be antagonistic except in certain moments of high crisis. And while this is so, human consciousness is a crippled thing." Feelers More Emotional Than Thinkers? Why Use Temperament over Type? What Is A �Shadow� In Myers-Briggs Theory? 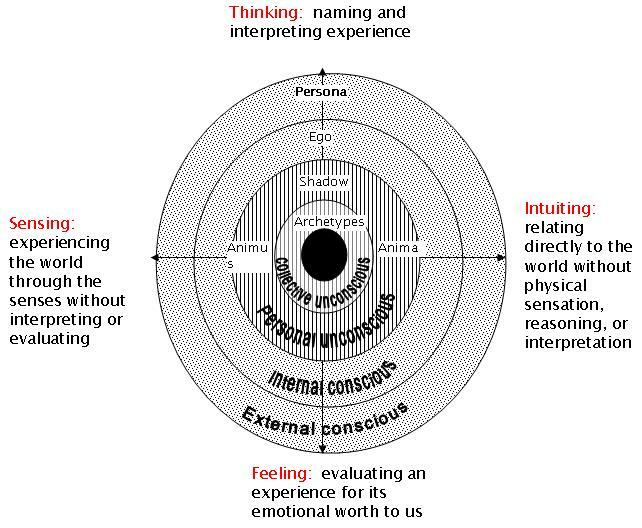 MBTI: What is Sensing? Intuition? Thinking? Feeling?